Butterflies with stars are a popular butterfly tattoo design for girls. This butterfly tattoo is inked on the shoulder. This shoulder butterfly tattoo includes two blue butterflies, one large and one small, which are located on this girl’s left shoulder. Along with the butterflies are several black stars and a swirly black line, which makes the butterflies look like they are in flight. 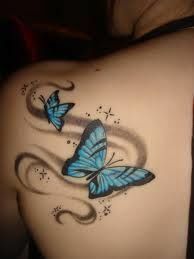 The blue color used in this girl’s butterfly tattoo is very bright and vibrant, and really stands out. Traditionally, blue butterflies are bringers of good luck and are also commonly used to represent remembrance. Many girls get blue butterfly tattoos as a symbol of good fortune, or as a means of remembering a loved one who has been lost. Even though blue butterfly tattoos for girls are common, this butterfly tattoo design is unique because it has an important meaning for the wearer.